Supporting couples as they prepare to conceive is a very interesting, challenging and also rewarding part of my work. Sometimes prospective parents come and see me to engage in pre-conceptual planning. However, more commonly I am seeing people with some unexplained fertility challenges. That is to say they have had the usual investigations done and no conclusions have been drawn as to reasons why they can't conceive. Sometimes, by the time I see them they are already on the list for IVF or for fertility treatment. Interestingly, the nutritional therapy approach can often lead to a natural pregnancy without the need for fertility treatments. This is always a delight when it happens and it is because we identify root cause. ​In the functional medicine approach, we are always looking for root cause and we turn over every stone until we find one. We don't just look at reproductive hormones, we look at the endocrine system as a whole, identifying potential challenges or imbalances with thyroid and adrenal health. Other hormones that can affect fertility are melatonin and vitamin D. We have access to a range of testing to identify any functional imbalances in these areas. All of these systems require specific nutrients for optimal function and we look to identify and address any deficiencies or insufficiencies in the current diet and digestive function. We look at past medical history and also any drug medications, past and present as these can affect reproductive health. Specific conditions that are linked with fertility challenges include PCOS, endometriosis, and fibroids. Nutritional therapy can be extremely helpful in these conditions. Polycystic ovary syndrome (PCOS) is often associated with insulin resistance and weight gain. However, many PCOS sufferers have neither. One of the areas being researched more commonly among experts in this field is the relationship between PCOS and adrenal health. This requires a detailed investigation into our stress hormones. The term PCOS itself refers to the appearance of many cysts on the ovary. Interestingly, not all women experience this symptom which has led to some experts wanting to change the name of the syndrome. There are also those women who have the unpleasant androgenic symptoms of acne and facial/ body hair, but others do not. As you can see, the number of variants of this condition can mean that women are under diagnosed. I have done a lot of research into this area myself as my daughter was diagnosed with this condition. I have completed advanced training in hormone health with the Institute of Functional Medicine. I also attended a fertility conference in London last year which considered these complex issues in great detail, covering the latest research from world thought leaders among obstetricians and gynaecologists. As these doctors work from the functional medicine model, they work with their patients using a diet and lifestyle model of care and investigate root cause. Sometimes in complex cases, functional testing can be pivotal. Risk factors for fibroids include heredity, age, race, diet, obesity, high blood pressure and early menstruation. Again, nutrition and lifestyle factors can be modulated to reduce the risk of fibroids and also to aid in fibroid reduction. In this case, both dietary factors and appropriate supplements are recommended. ​More information on endometriosis can be found in our recent blog. Although this is focussed around sperm in terms of numbers, size, shape and speed, men's reproductive health, just like women takes in a number of endocrine challenges. It's not just about testosterone levels. We need to fully understand the impact of other hormones including adrenal and thyroid. We also need to consider nutrient deficiencies and insufficiencies. One of the most important nutrients for men's reproductive health is zinc. However, certain drug medications, smoking, stress and low stomach acid, among other things can lead to low zinc status which can impact every aspect of sperm health. The health of our children starts with the health of their parents. This is why pre-conceptual planning is so critical so that prospective parents can optimise their own health long before a child is planned. The subject of epi-genetics teaches us that it's not so much the genes that count in terms of our risk factors for health challenges as the environment in which we place those genes. There is a well known saying that genes load the gun, but environment pulls the trigger. By environment, we mean everything that we are exposed to on a day-to-day basis from the chemicals in our toiletries and cleaning products to pesticides in our foods, heavy metal toxicity and drug medication. Never has there been a time in human history where consideration of these aspects and the need for mitigating against them was more critical. According to the non-profit organisation, The Environmental Working Group, a total of 287 known toxins were found in the umbilical cords of newborn babies. Exposure from toxins in chemicals, drugs and even sweeteners in the food chain have been shown to negatively impact the microbiome. This is particularly relevant when we think about increasing rates of atopic conditions like eczema, asthma and also increasing rates of autoimmune conditions and even cancers. Add to this the increasing number of children's conditions involving behavioural and neurological aspects such as autism, ADD and ADHD. The good news for prospective parents is that with an awareness of some of the above risk factors in terms of nutrition and lifestyle choices, we can make some impactful changes which will optimise our own health, but also create an optimal healthy environment in which to plant a growing child. The time to detoxify is NOT when we are pregnant as this would carry too many risks for baby. The time is as soon as we plan our first child. Our bodies already have a set of cleverly designed systems involved in detoxification which take in the gut, the liver, the kidneys and the skin. However, these systems depend on getting the right nourishment from foods which are often lacking in the modern diet. They may also be depleted due to drug medications, stress and poor absorption among other things. I work with my clients to teach them not only how to support these systems but also how to reduce their toxic load by making appropriate changes. We also have access to a variety of testing services which can offer us more accurate information on current nutrient levels, signs of digestive compromise, infection and dysbiosis. Testing can also identify heavy metal toxicity, among other things. We can also test a comprehensive range of hormones for both men and women, including reproductive hormones, stress hormones, melatonin, thyroid and neurotransmitters such as serotonin. 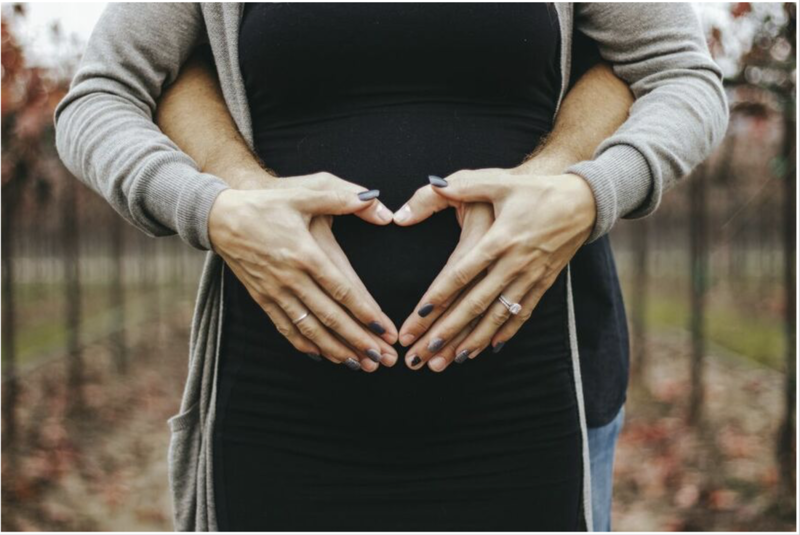 All of these factors have relevance to fertility, but also in prevention of pregnancy complications such as miscarriage, gestational diabetes and pre-eclampsia. This is an enormous topic, but this just gives you a general idea of some of the areas that are considered by nutritional therapists working with couples in pre-conceptual planning. ​Nutritional therapists can work with you throughout the pregnancy. Being pregnant is a wonderful and exciting time and for first time parents it brings with it lots of questions and a sense of the unknown. Which foods are the best foods for a healthy mum and baby? Which supplements are safe? Which supplements are optimal? Am I getting enough sleep? Am I exercising too much? What if I have food intolerances? How do I know I'm getting the right nutrients? Which nutrients do I need? How do I cope with symptoms such as back ache and heart burn and of course, pregnancy nausea? Nutritional therapists can help answer these questions and navigate you through a healthy pregnancy. I remember being so excited to find out I was expecting my first baby and was keen to do everything I could to keep myself and my baby well. Unfortunately, i was really sick with the first one which was pretty awful. I couldn't wait to get through the first trimester! Thankfully I was blossoming during the second trimester and only experienced a bit of heartburn towards the end of the third. I wish I had known about nutritional therapy then as I would have prepared myself a bit better pre-conceptually. A growing area of interest now is the benefits of probiotics in pregnancy. More information about nutritional therapy consultations and what is involved can be found here.